The Columbia Soccer Stadium seats 3,500 people. Columbia Soccer Venue at the Baker Field Athletics Complex boasts a new all-purpose turf suitable for rugby. The FieldTurf pitch is a hybrid fiber, rubber and sand infill blend designed to have a more consistent feel and a faster pace. The Old Blue Rugby Foundation underwrote the installation of a state of the art artificial FieldTurf surface at Baker Field’s Soccer Stadium, for use by both the CCRFC and it rugby elders, OBRFC. The Columbia men and women have access to the field for games during the season. In addition, Old Blue Rugby Football Club (originally formed by a group of Columbia grads) also has access to the field for their spring Super League games. The tract of land on which the Baker Field Athletics Complex stands was purchased for the University on December 30, 1921 by financier George F. Baker. Then a $700,000 gift, the 26-acre area was dedicated in April, 1922 and hosted spring football practice that same year. 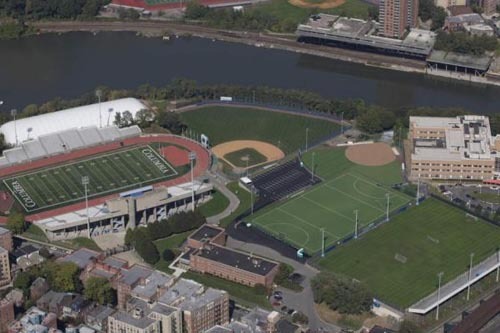 In the fall, Columbia's football team continued to practice at Baker Field, but played its games at South Field on the Morningside Heights Campus. The first stadium at the site, then known as Baker Field, opened in the fall of 1923 with 15,000 seats in temporary stands.